Nearly everything about Asheville-based band Skunk Ruckus is suffused with humor. But the band is very serious about its music. The inherent tension between those two realities is part of the band’s recipe for success, as is the band’s musical style: equal parts punk and mountain music, delivered in cheeky style. 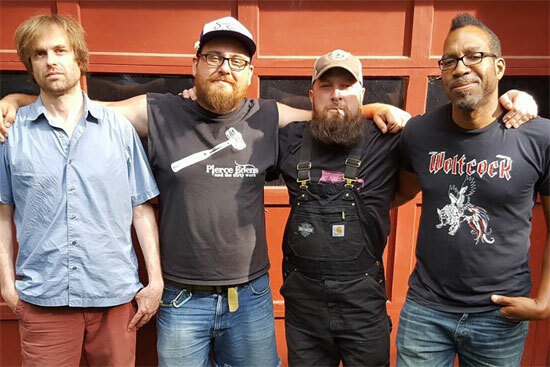 Skunk Ruckus celebrated the release of Pearls Before Swine with a hometown show at Asheville, North Carolina’s Mothlight on May 11. McCarthy chuckles and forges onward, undeterred. “We were playing a show and just kicking the crap out of it,” he says. And no one was responding. We might as well not have been there. And then Dave leaned over and said, ‘We are giving these guys gems!’ And I said, ‘Pearls before swine!’” It was all meant in good-natured fun, but the phrase stuck, and ended up as the album title. Gilbert notes that the band’s sound has developed since then, but notes with a smile that he sees his role as “thinking how to disrupt Jim’s thing as much as add to it.” Seemingly at odds with McCarthy’s musical mindset (“the more we morph or cross genres the more personally I keep attaching myself to an older and more traditional sound”), that push-and-pull is key to Skunk Ruckus’ overall sonic quality. “The bones are still the bass and banjo,” Steel says.